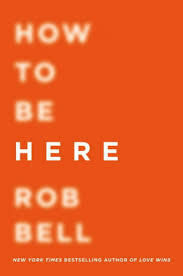 a book chick: "How to Be Here"
my take: Part memoir, part pep talk, Rob Bell's new book feels like he's chatting with you giving you great life advice: Be here. Details matter. Clear the clutter. Start with 1. There is a difference between craft and success. The easy going vibe, the minimal writing style, the relatable stories, and probing questions make this an inspiring read for making your life HERE and NOW a work of creative participation. Very much in the vein of Big Magic (Liz and Rob are pals) - all good.